Cork is the bark of the cork oak tree. The cork oak is a medium-sized, evergreen tree that grows in the cork oak forests of Western Mediterranean countries. 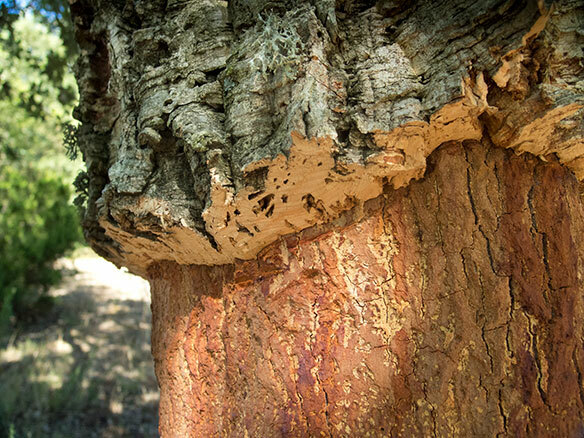 Its the only tree whose bark regenerates and cork is used to produce a variety of products including (most notably) wine stoppers, architectural products, aerospace and transportation components, consumer goods, construction products, as well as the final coverings for floors, walls, ceilings, facades, and roofs. 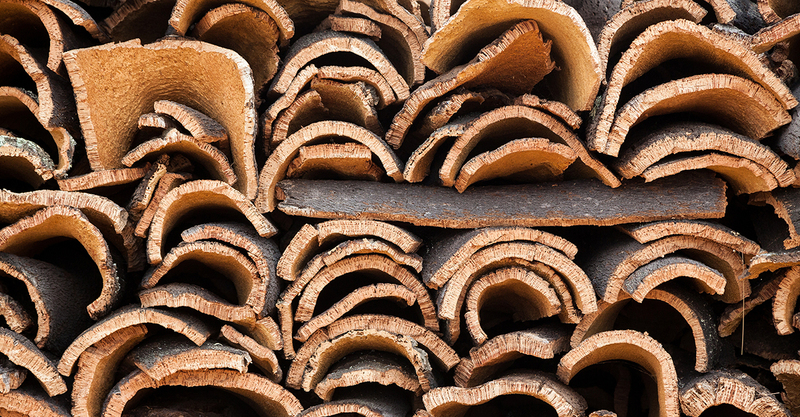 Cork has been used since ancient times as fishing and domestic products, sandal soles and insoles, and wine stoppers. Although there are records of vessels sealed with cork in the 3rd century BC, the major revolution only took place in the 17th century with Dom Pérignon. The French monk, who would become famous for his champagne, sought an alternative to the stoppers used at the time—wood wrapped in hemp soaked in olive oil—which did not provide an effective seal, were dubious in the preservation of wine, and were always popping out. His solution was cork. This choice fostered the growth of the wine and cork industries that have evolved together over hundreds of years. In more recent times, cork is the only organic substance to travel to Mars in the Viking space probes. 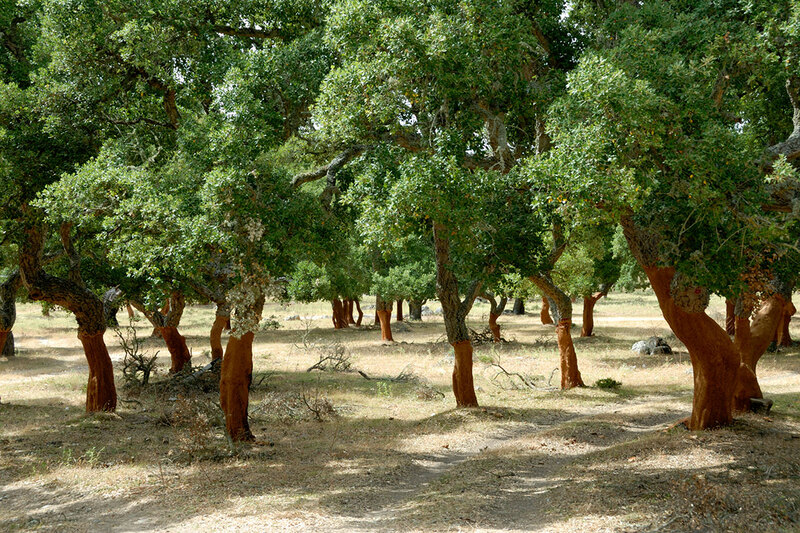 The cork oak forest (called montados) is found in Portugal, Spain, Italy, France, Morocco, Tunisia, and Algeria and cover 2.1 million hectares (or 8,100 square miles). Approximately 340,000 tons of cork are harvested each year from these forests at a value of €1.5 billion. Portugal, which has a third of the total area of cork oaks, is the largest producer with about half of the world's cork production. These trees are so important to the Portuguese that they cannot be legally cut down. In addition, the forests are one of the 35 most important ecosystems in the world—comparable with Amazonia, the African Savanna and Borneo. These forests retain up to 14 million tons of CO2 annually, contributing to the reduction of greenhouse gases. Over 200 animal species and 135 plant species find ideal conditions for survival in the cork oak forest and over 100,000 people directly or indirectly depend on this forest. Cork harvesting is the highest paid agricultural work in the world. Cork harvesting is done entirely without machinery. The workers who specialize in removing the cork are known as extractors. Extractors use a very sharp axe to make two types of cuts on the tree: one horizontal cut around the plant, called a crown or necklace, at a height of about two to three times the circumference of the tree, and several vertical cuts called rulers or openings. To free the cork from the tree, the extractor pushes the handle of the axe into the rulers. This is the most delicate phase of the work because, even though cutting the cork requires quite a bit of strength, the extractor must not harm the tree. These freed portions of the cork are called planks which are usually carried off by hand since cork forests are rarely accessible to vehicles. 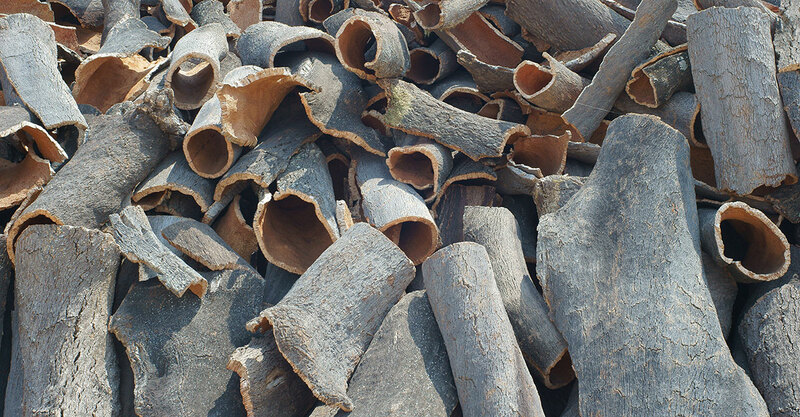 The cork is stacked in piles in the forest or in yards at a factory, and traditionally left to dry, after which it can be loaded onto a truck and shipped to a processor. 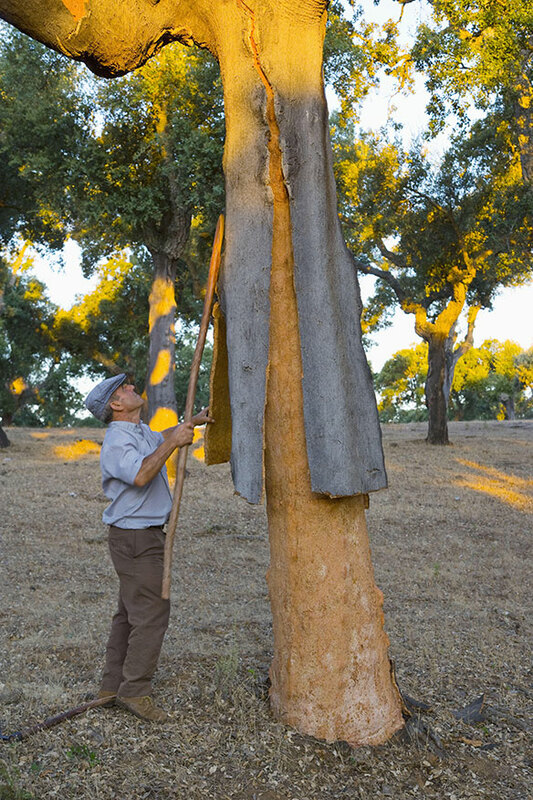 An average of 40 to 60 kg (90 to 130 lbs) of cork is harvested from each cork oak. After the harvest, the tree itself is marked and numbered, so that future harvesters will know that particular tree needs nine to twelve years before it is harvested again. The weathered stacks of cork are trucked from the cork forests to Portugal’s cork factories and stacked for an additional three to six months to weather and dry. This allows the optimal amount of moisture in the cork crucial for the elasticity and compressibility of the cork. Each load is labeled and registered so that each batch can be traced to its origin — traceability is very important to guarantee quality and a key factor in maintaining the chain-of-custody and certification by the Forest Stewardship Council® (FSC). Cork that has recently arrived is more conspicuous as it is brighter in color next to the grey cork placed for a longer period of time. After the resting period, the planks are sorted. The high quality cork will be transformed into stoppers. The thick cork, with the height needed to extract a whole long single stopper, is used for natural stoppers. The thin cork will be transformed into disks, to be used in the technical corks. The thick cork production process starts when the planks are stacked flat and boiled for at least one hour in stainless steel tanks. 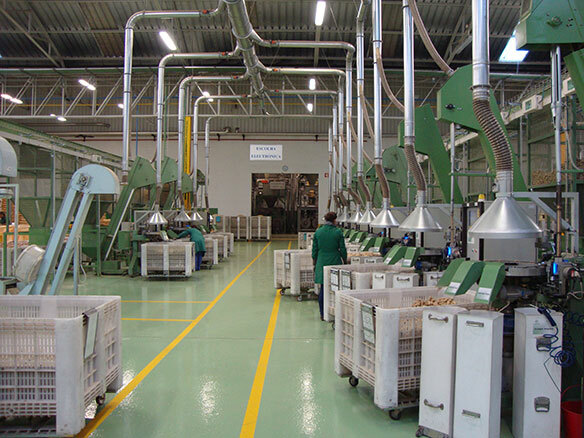 The goal is to remove impurities and reach the ideal moisture content for processing. This makes the cork plank flatter, smoother, more pliable and causes the plank volume to expand by about 20%. After another three-week resting period, the edges of the planks are prepared and the corners trimmed before the planks are separated into quality categories, based on their thickness, porosity, and appearance. Those with defects are sent to be ground and used in other products. The trimmed planks are sliced into strips approximately as tall as the finished stopper and a little deeper than the eventual stopper width. A highly precise manual or semi-automatic process punches the stoppers. The manual punching process results in greater consistency in quality, since each worker can choose the best segments of the strips of cork. Skilled workers can punch up to 20,000 stoppers a day. Fully automated machines also punch corks however do not punch as high a percentage of high quality corks as the machine can’t make determinations on the best location to punch. The stoppers are separated mechanically and photographed by sophisticated computers which classify them based on visual quality. Cork is a very light raw material, weighing just 0.16 grams per cubic centimeter, and can float. Its elastic memory allows it to be compressed to around half its thickness and return to its original shape making it the only solid which when compressed on one side, does not increase in volume on the other. It is practically impermeable to liquids and gases. Cork is highly resistant to moisture, and therefore to subsequent decay, and is an excellent thermal, acoustic, and vibration insulator. 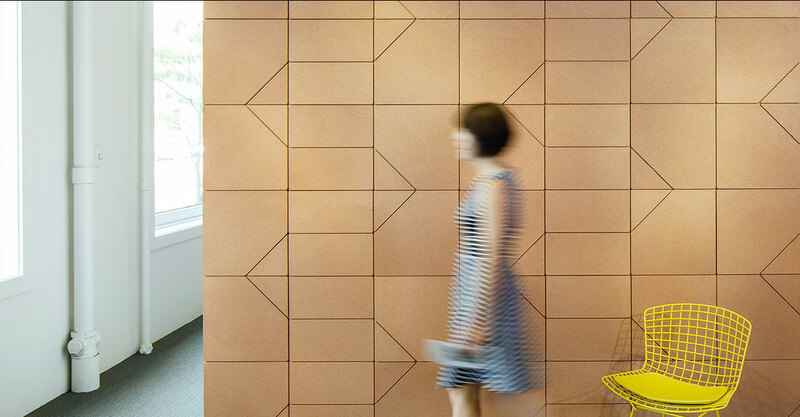 Cork is a natural raw material and is 100 percent biodegradable, recyclable, and renewable. 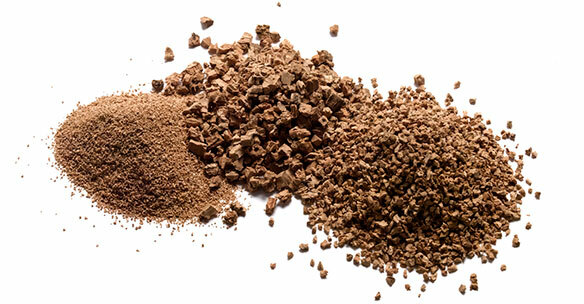 And cork may be ground up and formed into new cork products giving it an incredibly long lifespan. 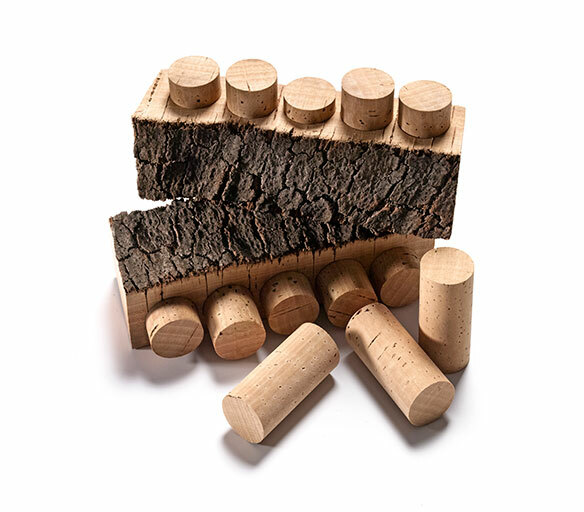 Just 25–30 percent of cork is used to manufacture natural stoppers, but what is left is not wasted—it is transformed into granules and returned to the production process. The same happens when cork stoppers are rejected by quality control. Unused cork, scrap, poor quality, and dust are collected for processing into other cork products or even burned for heat in the factories. Nothing from the cork tree is wasted. In addition, used cork stoppers may be recycled. Many supermarkets, airports, restaurants, wineries, sommeliers, and schools have helped collect tens of millions of cork stoppers that have been recycled. This waste and recycled material is ground up into granulated cork which can be mixed with resin to form products including Spinneybeck’s Beller Collection cork tiles which are 93% recycled cork.